A few days of rain and containers forgotten in the garden are filled with water. If ever, now is the time to take a bath; soon it may be limited to dry-cleaning only . House sparrows are mostly sedentary birds and, living close to humans, find their food near them. Where cattle are still kept we see house sparrows near animal sheds; there they stay for winter in small groups. 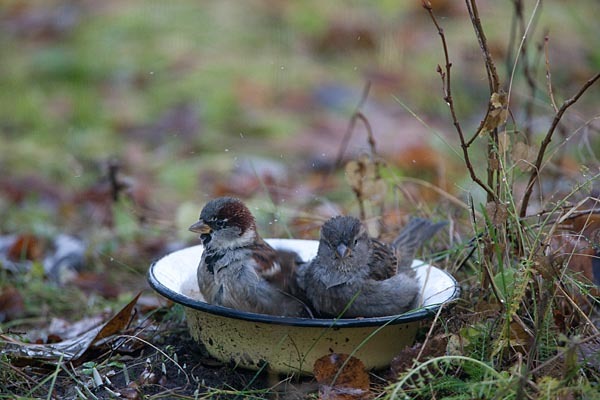 The photo shows a pair of house sparrows caring for their personal hygiene. The male has a black throat patch that is missing in females, so just a look and all is clear. We can observe other differences too: the top of the male bird’s head is grey and a brown arched streak runs from the eye. The female sparrow has a brownish head and the brown of the eyebrow streak is paler. The plumage of the male bird is brighter, the back is chestnut brown, with yellow and black. The female bird’s back plumage: grey, with black and beige. On the brownish wings both have a white band and black lengthwise stripes, chest is "sparrow grey“. Their winter number is estimated to clearly more than a quarter of a million birds.